Tuesday March 19th 1878 I helped do the work all the forenoon and as soon as I ate dinner Mollie and I went over to try for pictures she came right back. I went into the store and invited Mr. Whetstone over for the evening. I called Mr. Crippens and had a talk with him in regard to joining the church. I was at Win's and called to see Mattie Templin but did not find her at home. I call at Mrs. Rogers and saw Mrs. Kimball. I got home at five oclock. We got supper over in good shape. The girls came over in the evening and we had a very pleasant time. 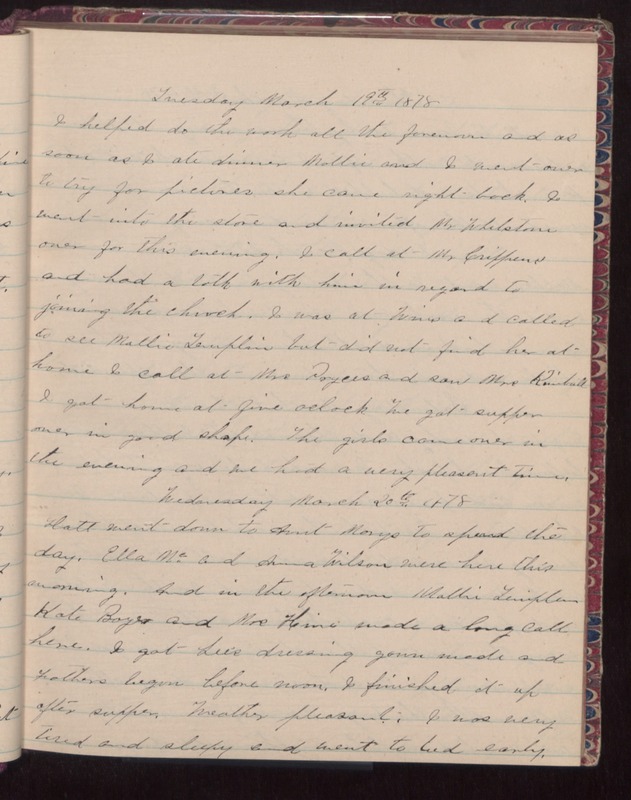 Wednesday March 20th 1878 Hatt went down to Aunt Mary's to spend the day. Ella Mc and Anna Wilson were here this morning. And in the afternoon Mollie Templin, Kate Boyer and Mrs. Hine made a long call here. I got Lee's dressing gown made and Father's begun before noon. I finished it up after supper. Weather pleasant. I was very tired and sleepy and went to bed early.